Texans haven't changed their answers on the biggest problems facing the state and the country — or on how the state and the country stack up, according to the latest University of Texas/Texas Tribune Poll. Texans remain concerned about economic issues nationally, and about immigration and border issues in their home state, according to the latest University of Texas/Texas Tribune Poll. The economy, federal spending and the national debt still top registered voters’ list of the most important problems facing the country, the poll found. And border security and immigration remain the top problems facing the state. Concern about political corruption and leadership was in third place on both lists, boosted by self-identified Republicans on the national list and by self-identified Democrats on the state tally. The top three items on the national list accounted for about a third of all respondents; on the state list, 45 percent listed one of those top three items as the most important problem. “Border security and immigration is a constant, and everything else comes up as a matter of context,” said Daron Shaw, a professor of government at UT-Austin and co-director of the poll. He said recent news of shootings and violence involving police hasn’t lifted race relations or gun violence up on Texas voters’ list of pressing problems. “Those incidents might drive ratings for CNN, but they don’t seem to move people’s perception of the most important problems,” he said. 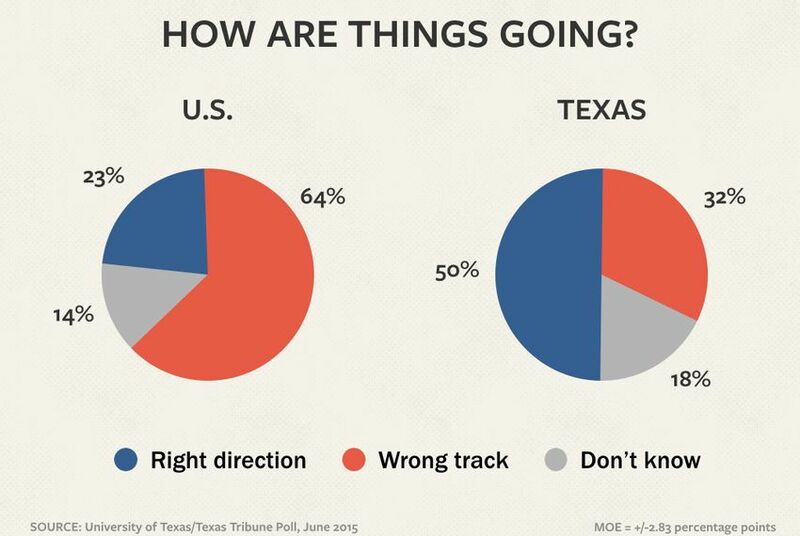 As in earlier UT/TT Polls, Texas voters are happier with the direction of the state than the country. While 64 percent said the country is on the wrong track, 50 percent said the state is moving in the right direction. 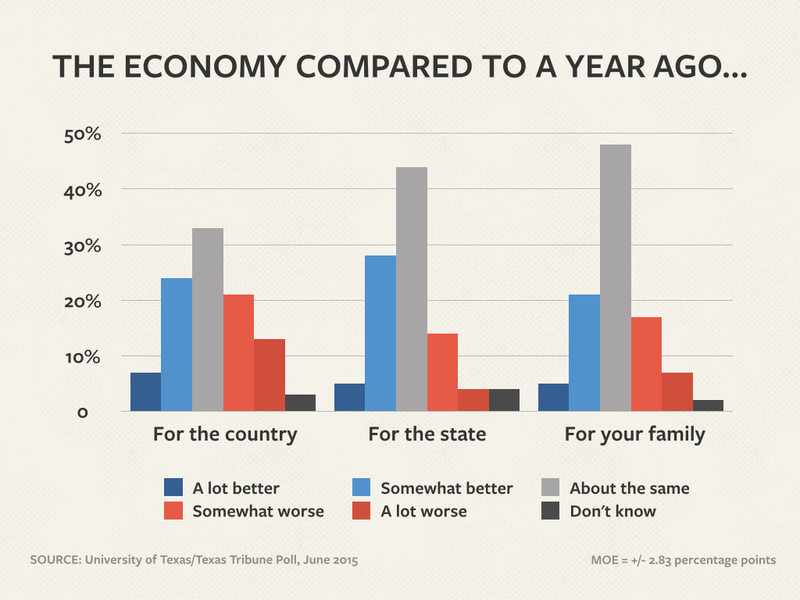 They were more positive about the state economy, too: 33 percent said the Texas economy is better off than it was a year ago, while 18 percent said things are worse and 44 percent said they are about the same. The national economy is better off now, 31 percent said, but another 34 percent said things are worse than they were a year ago and 33 percent said things are about the same. Asked about their personal and family economic situations, 48 percent said things are about the same as a year ago, while 26 percent said things are better and 24 percent said things are worse. Voters gave good marks to Gov. 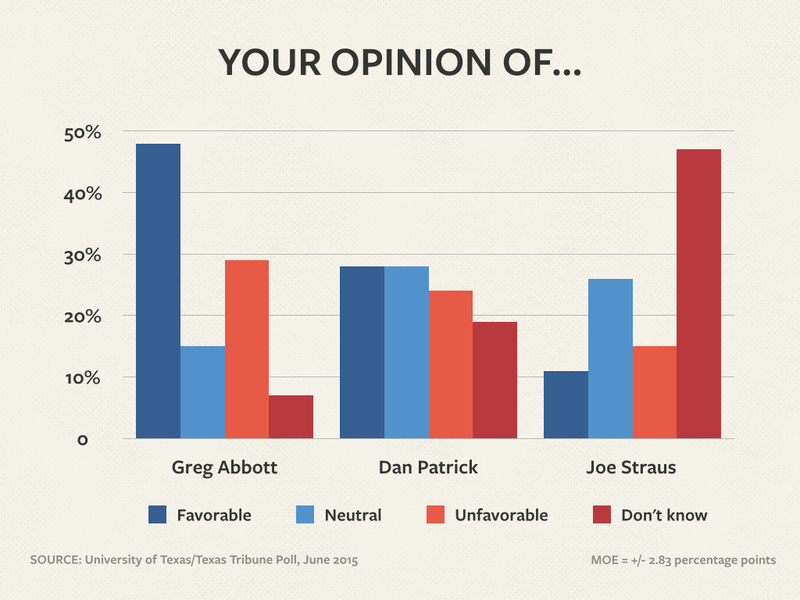 Greg Abbott: 48 percent said they have a favorable opinion of him, while 29 percent said they have an unfavorable one. Only 7 percent had no opinion. House Speaker Joe Straus is much less well known, with 47 percent saying they have no impression of him and another 26 percent saying they have a neutral impression. Among those who know him, 11 percent had a positive opinion and 15 percent had a negative one. Lt. Gov. Dan Patrick fell in between, with 28 percent saying they have a favorable opinion of him and 24 percent holding a negative one. About one in four have a neutral opinion, and only 19 percent said they had no opinion at all. Almost half — 46 percent — said they approve of the job Abbott has done as governor, while 24 percent disapprove. For Patrick, 32 percent approve and 24 percent disapprove. The Legislature as a whole didn’t do as well as those two statewide elected leaders did, getting favorable marks from 42 percent of voters and unfavorable ones from 30 percent. Texas lawmakers came out better than their federal counterparts, however: Only 15 percent of voters approve of Congress, while 62 percent disapprove. This is one of several stories on the latest University of Texas/Texas Tribune Poll. Previously: The presidential primaries. Also today: Guns and discrimination. Tomorrow: Social issues.